Sempre quando vai chegando o final do ano eu fico com aquela sensação de que não vai ter mais nenhum livro sensacional no meu hall de leituras. Mas sempre estou errada quanto a isso e Thank God! Demorei dois dias para terminar de ler este livro, e só não o fiz no mesmo dia pois já passava da 1h da manhã e eu tinha que trabalhar no outro dia. Eu fiquei tão imersa na história, tão querendo saber quem raios tinha matado a pessoa que não vi o tempo passar. Como eu ADORO isso! A história é muito bem construída, e você junto com Rachel quer muito que ela lembre tudo que aconteceu. Basicamente o plot é que Rachel vê uma mulher a qual observa todos os dias quando passa de trem beijando outro homem que não seu marido. No dia seguinte a esse evento a moça desaparece e Rachel não consegue lembrar o que aconteceu na noite deste mesmo dia na qual ela tem certeza que viu a moça desaparecida. O fato de não conseguir se lembrar do que aconteceu se deve a Rachel ter problemas com bebida. Ela se tornou um alcólatra e você entenderá porque ao longo da história. O livro é narrado pelo ponto de vista das 3 mulheres principais da história, porém Rachel com certeza pode ser apontada como principal já que a história gira fundamentalmente em torna dela, que está tentando lembrar tudo que aconteceu. Não dá pra falar muita coisa para não estragar todo mistério, só posso dizer que não são muitos os livros que conseguem me manter acordada num dia normal no meio da semana. O gatilho da curiosidade foi acionado fortemente neste caso. Ah, falando do filme, o qual eu ainda não assisti, algumas amigas me disseram que a história ficou muito bem adaptada, pois os items adaptados não modificam em nada a essência dos personagens ou os acontecimentos da história. 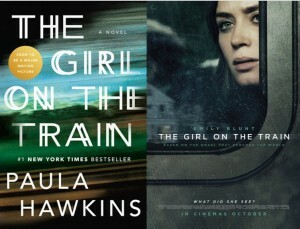 Por exemplo, no livros os acontecimentos se passam em uma área ao redor de Londres, já que Rachel pega o metrô que leva para Londres todo dia. Já no filme eles adaptaram o local para uma área ao redor de Nova Iorque e Rachel pega o metrô para ir a Nova Iorque no caso. 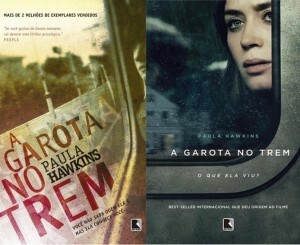 Outra coisa que apontei só de ver o trailer é que Rachel no livro é descrita como um pouco acima do peso, e no filme isso não se mostra já que a atriz escolhida para o papel, Emily Blunt, é magra. De qualquer forma dizem que sua atuação está superando e muito este fato, e isso dá pra ser notado já no trailer do filme. Emily é Rachel sem sombra de dúvidas. Antes de começar a ler o livro confesso que Rachel estava em primeiro lugar na minha lista de suspeitos, mas isso foi descartado logo que comecei a ler a história. Achei que seria muito óbvio se fosse ela e a autora não daria essa bola fora. Depois foquei em duas pessoas, o ex-marido de Rachel e sua nova esposa. E enfim, eu estava certa quanto a um deles rs. Whenever the end of the year is coming, I get the feeling that there won’t be any other sensational book in my reading hall. But I’m always wrong about this and Thank God! It took me two days to finish reading this book, and I didn’t do it on the same day because it was past 1 am and I had to work the other day. I got so immersed in the story, so wondering who the hell had killed the person I didn’t see the time go by. How I LOVE it! The story is very well built, and you and Rachel really want her to remember everything that happened. Basically the plot is that Rachel sees a woman whom she watches every day when she goes by train kissing another man than her husband. The day after that event the girl disappears and Rachel can not remember what happened that same night that she is sure to have seen the missing girl. The reason she can’t remember what happened is because she has a drinking problem. She has become an alcoholic and you will understand the reason throughout history. The book is narrated from the point of view of the three main women in the story, but Rachel certainly can be singled out as the main character since the story is turning mainly around her, which is trying to remember everything that happened. There’s not much I can say about it to not ruin all the mystery, I can only say that not many books can keep me awake on a normal mid-week day. The trigger of curiosity was strongly triggered in this case. Oh, speaking about the movie, which I still have not watched, some friends told me that the story was very well adapted, because the items adapted didn’t change in any way the essence of the characters or the events of the story. For example, in the books the events happen in an area around London, since Rachel takes the subway that takes to London every day. And in the film they adapted the place to an area around New York and Rachel takes the subway to go to New York in this case. 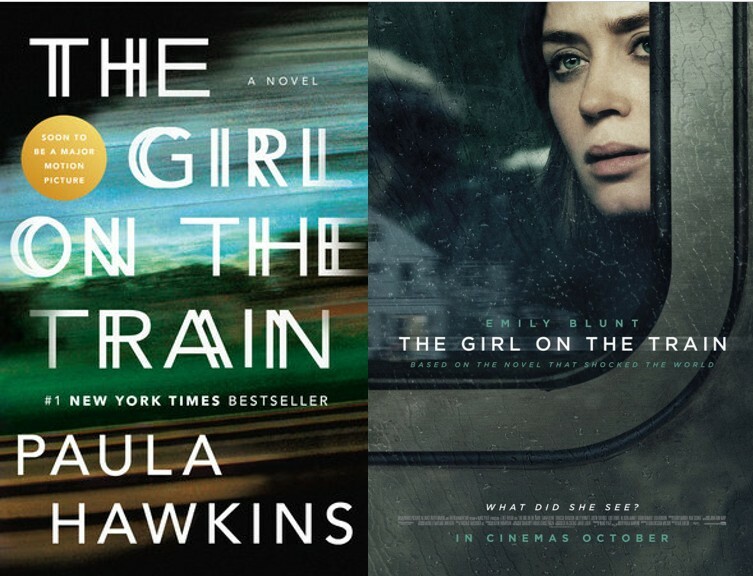 Another thing I just pointed out from watching the trailer is that Rachel in the book is described as being a bit overweight, and in the movie this does not show up since the actress chosen for the role, Emily Blunt, is thin. Anyway they say that her performance is surpassing and much this fact, and this can be noticed already in the trailer of the film. Emily is Rachel beyond any doubt. Before I started reading the book I confess that Rachel was first on my list of suspects, but that was discarded as soon as I started reading the story. I thought it would be very obvious if it was her and the author would not give it away. Then I focused on two people, Rachel’s ex-husband and his new wife. And anyway, I was right about one of them hehe.